McEvoy wins GO GREEN challenge! 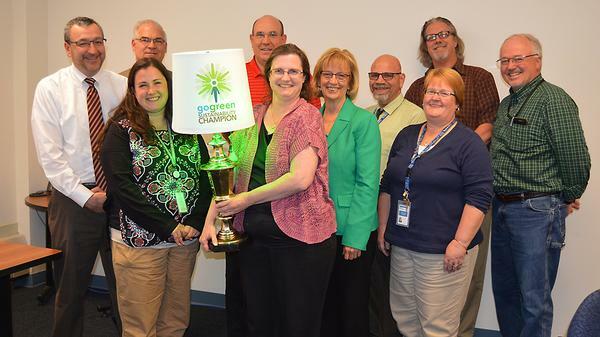 Students and staff in the OCM BOCES McEvoy building won this year’s Go Green Challenge, pulling out a victory by 14 points over Operations & Maintenance/Central Receiving. As a result, students and staff at McEvoy will receive the coveted “Go Green” trophy lamp and a pizza party for the entire building. Congratulations, McEvoy! Check out the final results on our Go Green web page. Five of the nine buildings that participated in the challenge were able to increase their recycling volume by 10 percent or more. Those buildings were Cortland Alternative School, Seven Valleys New Tech Academy, McEvoy, the Henry Student Services building and the Main Campus. Three buildings reduced their monthly trash volume, freeing up more space in landfills. Those buildings were the Henry Student Services building, the Henry Career & Technical Education building, and McEvoy. Students in Terri Wood’s class recycled plates and coffee mugs and transformed them into birdfeeders. In addition, backdrops and props for the annual Spring Show incorporated recycled cardboard and coffee cans. Computer tech students recycled computer parts to make new computers for welding students. In addition, computer tech and automotive tech students recycled computer magnets to make phone chargers. A building-wide effort to use more digital resources, such as Google Docs and email, had students using far less paper. Renee Mitchell-Compton, McEvoy’s Go Green building representative, said she was “very proud and pleased” with everyone’s hard work and was looking forward to a great pizza party. “I think we’ve made a lot of progress but there’s still progress to be had,” she said. On Friday, Mitchell-Compton presented the school’s first-ever Go Green award to one of the building’s Go Green ambassadors, Angela Panetta, who worked on a children’s book about recycling as part of a class project and helped McEvoy students sort trash from recyclables. The Go Green Committee would like to thank everyone for their hard work and vigilance in making this challenge a success. They also gave a special shout-out to building custodians, who worked exceptionally hard to report and track results. Stay tuned for more information about next year’s challenge - but please keep recycling, reducing your trash, conserving energy and doing whatever you can to preserve the environment! Members of the Go Green Committee met recently to discuss results of this year’s challenge. From left to right are building representatives Phil Grome (Henry CTE & Student Services); John Wisniewski (standing in back, Operations & Maintenance/Central Receiving); Tabitha Gaglianese-White (Henry CTE); Sean Joyce (Main Campus, lower level and 2nd floor); Renee Mitchell-Compton (McEvoy, holding the championship lamp); Deb Ayers; Louis Lardear (CNYRIC); Clar Wilkinson (Crown Road, Special Education); Dave Sampson (standing in back, Crown Road, Alternative Education); and Mike Oemcke, energy analyst.